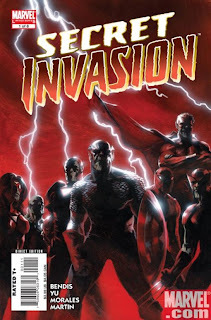 The Billionty-Oneth Geek: Marvel's SECRET INVASION!!! Secret Invasion is the 2008 cross-over followup to 2007's World War Hulk from Marvel Comics. It's a return to form for writer Brian Michael Bendis, who also scripted the much talked about Civil War for Marvel. Secret Invasion tells a fascinating story. What if the heroes you knew all along were really Skrulls? Okay, let me back up for second. In the Marvel Universe, Skrulls are a shapeshifting alien race, often adversaries of the Fantastic Four. So yes, staple heroes like Captain America, Spider-Man, Wolverine... what if they weren't who you thought they were? That's the heart of the story in Invasion. 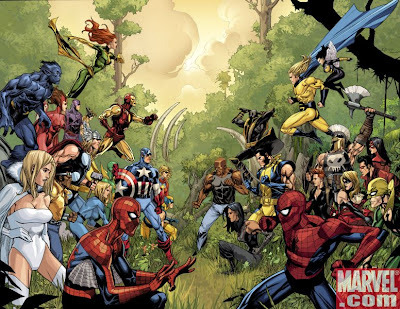 The series had its share of ups and downs, and like Civil War before it, more intrigue came at the end of the series than the duration. But much like Civil War, Invasion succeeded in creating a dialogue amongst the Marvel fans; whether it be positive or negative, people had something to talk about. I think there lies Bendis' strength; in crafting stories with a little real world flavour but that's never too contrived for the comic book world. This idea for Secret Invasion was years into the making. When Bendis first started working with Marvel apparently he left clues within the books he was working on that foreshadowed some of the things to come in this series. He was also able to bring up events of past and merge them into this story to create a greater sense of continuity. The series had some great concepts and ideas but the problem for me came down to the execution. The series spans only eight issues and for the first five or six, the bulk of the heroes spend their time on the Savage Land wondering "what's going on?" or "are you the real _____ (insert name)". There could have been so much more to do if he were to bring the story more on the homeland side rather than the island. When the series came to its finale, it felt all too rushed for one issue, cramming everything together and tying loose ends. One side are the real heroes, the other are alien impostors. Can you guess who's who? I think the grandest mistake that he made was to tie up all the loose ends. Basically all the proposed changes that he introduced in issue one and built upon throughout the series were reversed by the time the story ended. So it's almost as if nothing changed at all. At least with Civil War it left a lot open and seemed more of a jumping point to other stories rather than ending with such finality. But as I mentioned before, there is intrigue left at the end (I think the final panel actually) leading to the Dark Reign storyline, which according to some fanboys, is the better story. The series captivated me in its first issue, but with each progressing issue, my interest waned. They had some really great ideas that they could have had fun with, instead we were stuck on an island. But on the plus side, overall the story was more compelling and interesting than World War Hulk, so it has that going for it. It's a worthwhile read if only to get to that point of asking questions about our heroes. Later geeks.